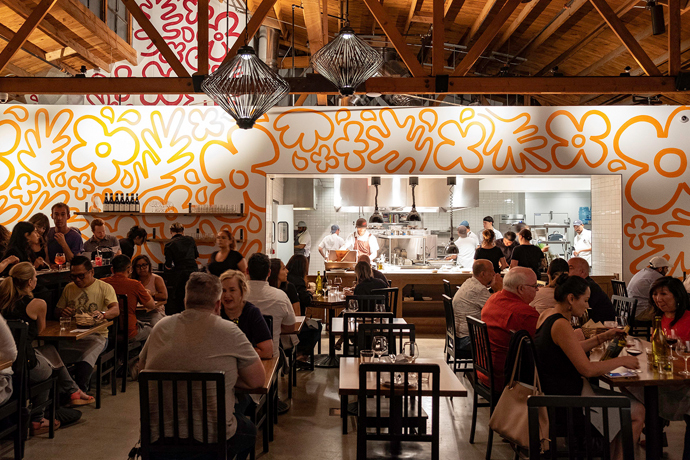 Welcome to Aburiya Toranoko, a den of Japanese curiosities from the owner of the Lazy Ox Canteen next door, opening one week from tonight in Little Tokyo. So picture it. The sun’s gone down, you’ve picked up your date, and you’ve just stepped into a room with concrete floors, black chandeliers and a big graffiti mural down one side―it feels a little like you’re tucked beneath the city’s classiest overpass. Make your way to the head of the long communal table in the middle, order a round of hand-blended Kyoho Grapes (white-grape vodka, mint and grape sorbet), then a round of Maker’s Mark BBQs (bourbon, sweet vermouth, Aperol and barbecue sauce). And then you’ll be ready for what’s to come. If you’re feeling brave, you’ll try plates of chicken hearts, Beef Tongue in Marinated Miso and, yes, intestines (they’re beef, pork, chicken and lamb). If not, they’ve got more traditional sashimi and some nice fried chicken―and it’s all from a chef who’s a longtime Nobu vet. So the guy knows his beef tongue.